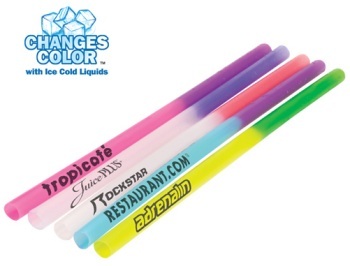 Mood Straws are reusable heavy-duty plastic straws that add fun to your promotional message. Great for restaurants to advertise your logo or message. Your customers are sure to take them home and remember you! 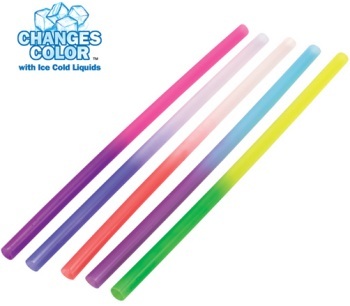 These Mood Straws change color with ice cold liquids. Made in the USA. Mood Straws come in five fun color combinations: pink to purple, frosted to blue, frosted to red, blue to purple, yellow to green. If straw color is not specified, assorted colors will be provided. Benefits of laser engraving provides for a custom imprint that does not rub off. No ink contact with liquids or mouth. Laser imprint appears charcoal colored. Mood Straws are 9" long and .354" diameter with an imprint area of 1/5" (0.2") high x 3-1/2" long. Mood Straws are also available with no imprint (blank product).